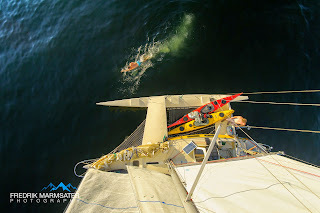 Search craigslist Seattle, "Custom 34' Crowther Trimaran" for additional pictures, etc. It's time to pass Lung-Ta to someone who will have more time to sail this boat than I currently do. After a great summer sailing/kayak surfing adventure in 2014, I spent much of this winter preparing the boat for the Race to Alaska. Alas, one month from the start of this epic race, I had to pull out due to outside circumstances. Lung-Ta is more ready than ever for the next adventure--whatever that may be. The boat sails like a dream, is very comfortable, and looks absolutely stunning. (allowing round-chine x-section), West System/fiberglass sheathed, and decks Brunzeel marine ply. Hull, deck, daggerboard, rudder all in excellent condition. New tall rig and stainless rigging 2013, new ss chainplates, new running rigging 2014, dbl topping lifts, vang, running backs, Amsteel. 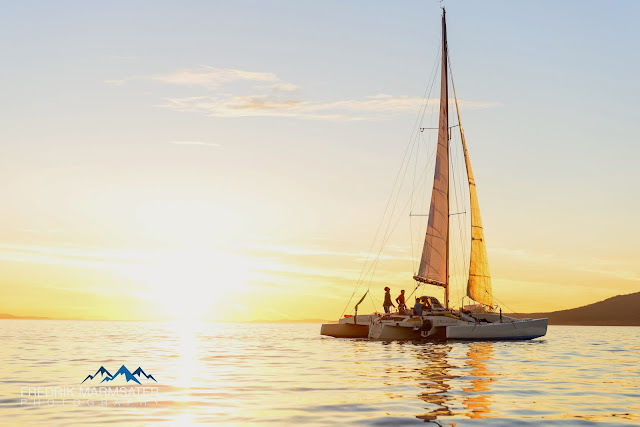 Sails in excellent condition: Custom modified main (full-battened, heavy dacron) with 3 reefing points, All headsails by Quantum (#1, #3, #4, high-wind blade, reaching sail w/stay'sl, 1.5 oz. symmetric spinnaker) and are carbon/kevlar or pentex construction, w/#6 luff tape. The #1, #3, #4 all have sausage deck-launch bags. Spinnaker has turtle launch-bag. Showing new portlights and new cabin-side paint. New Harken Carbo Racing Foil for headsails. New Harken Mainsheet control, double mainsheets, Yale PHD Racer line. Custom hard dodger 2014. Enables one to stand in companionway completely protected from the elements, steer, and protects helmsman from wind and spray. Lunasea Masthead tricolor, anchor, strobe light. New stainless rudder hardware installed April 2015. Very strong, no play or looseness in rudder connection. New bottom paint April 2015. Down below: berths for 4, new Dickinson P9000 propane cabin heater (awesome), SeaCook gimballed cook stove. Lunasea LCD lighting (both warm white and nighttime red). Chart table to Stbd. Galley to Pt. Ample storage for sails, food and water for 2 people for one month. 2 new AGM batteries (50 and 79 amp-hour) and two 100-amp solar panels/charge controller. New Lewmar Ocean Hatch (24" opening), 2 new Harken winches (5 winches total). Yamaha 9.9 four-stroke long shaft with custom cowling, low hrs. well-maintained. Ground Tackle: 33lb. "Bruce" claw w/30' 3/8"galv. chain and 250' 8-plait. 22lb. Bruce w/20' 5/16" chain and 200' Nylon. "Lung-Ta" is the perfect vessel for the performance-oriented sailor who wants to go fast, and be comfortable both under sail and at anchor. The interior is simple and comfortable, and the cockpit can accommodate multiple steering stations. She is a joy to sail; very smooth and predictable, not twitchy. She moves in the slightest of wind, yet can be reefed way down to handle the strong stuff. This design has proven ocean-capable. She is ready to go up to Alaska, around Vancouver Island, or south to Mexico and beyond. 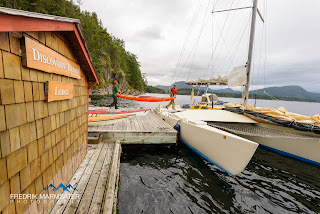 Or, just enjoy heading to Desolation Sound, as some of the best sailing in the Northwest exists in the Strait of Georgia, BC. Sailing north in the Starit of Georgia. Still sailing in almost no wind. Image showing main with 3rd reef taken.